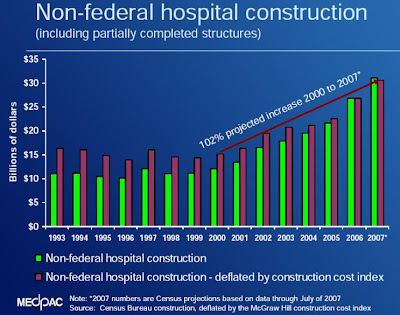 The financial crisis has constricted access to capital and also has increased the cost of capital, hurting hospitals that need copious capital to continue to fund their investments in buildings, plant, and increasingly sophisticated capital equipment. The turmoil and poor performance of the stock markets have hurt on several fronts. 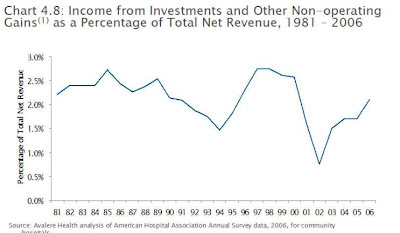 First, hospitals' investment income has fallen or become negative. 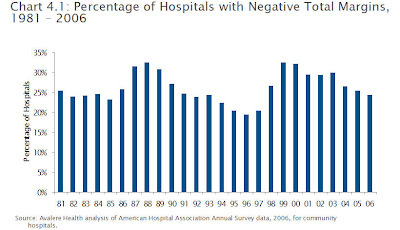 Second, hospital endowments have taken a hit and have seriously shrunk. Third, as the economy weakens many wealthy benefactors are probably dialing back their philanthropic contributions. Fourth, many hospitals still have defined benefit retirement plans... market losses may have adversely effected the funding of these plans, requiring hospitals to use operating cash to shore up the funding of their pension plans. Layoffs swell the ranks of the uninsured, and degrade the abilities of self-pay patients. Employers respond by decreasing their employees' coverage and increasing co-pays. All of these result in increases in hospital unreimbursed expenses and bad debt. People often put off seeking medical care - as a result they often are sicker when they go to the hospital, and often they end up using the hospitals' emergency departments, thus increasing ED usage and increasing hospital costs. Insurance companies increase their scrutiny of hospital billings. 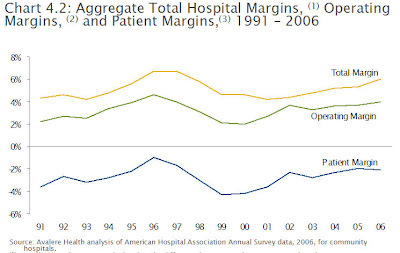 This increases the length of time it takes to pay bills, thus hurting hospitals' cash flow. Rejections also increase, also hurting revenues. 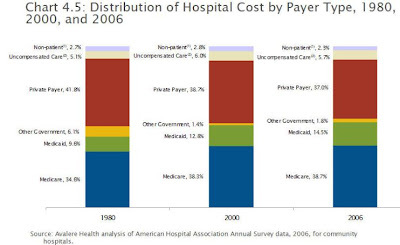 A large portion (approximately 50% or more, see graph) of hospitals' revenue comes from federal and state governments. 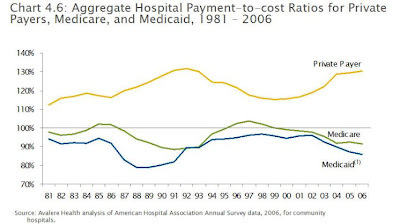 As these entities feel the pinch they reduce hospital payments / reimbursements (which already are often below costs, see graph above). This further pinches hospital revenues. Additionally, reimbursements for hospital acquired infections and other "never events" are being eliminated, Medicare is increasing its use of recovery audit contractors, etc., all also leading to decreased reimbursement. Hospitals’ Response to the Current Financial Market from IMA Consulting's Insights makes the same points, albeit much more elegantly. In addition they point out that a worsening balance between revenues and expenses could violate existing bond covenants (from current debt), leading to increased expenses or the need for remediation that negatively impacts the hospitals... The article also suggests what the hospitals can do to reduce expenses.